The entire boathouse traveled again last week and ran into some tough racing in uniformly miserable conditions in Boston and Derby. Race recaps are below a preview of this weekend's action. The HEAVYWEIGHTS will be home for the Bill Cup against #14 Boston University and Rutgers. Racing starts at 12:00pm. Please park at the Rugby Fieldhouse parking lot and use the free shuttle to get to and from the viewing area at the Chieftain. The WOMEN travel to Syracuse to compete for the O'Leary Cup against Syracuse and Radcliffe. Racing starts at 8am. "MIT hosted the Dartmouth and Harvard lights in a blustery Biglin Bowl regatta this weekend. Dartmouth came to Boston holders of the Biglin Bowl after defeating the Harvard and MIT varsities by .05 and15 seconds, respectfully, in 2008. This year Dartmouth snagged a 7 seat lead off the line in the Varsity race but were reeled back by Harvard and MIT in the 1st 500m. The Big Green struggled to match the faster pace of the Crimson and held off a charging MIT over the second thousand meters eventually losing to Harvard by 12 seconds and defeating MIT by .6 of a second. The 2nd Varsity eight and 3rd Varsity four races were both similar; Harvard jumped out off the starting line and never looked back, eventually taking the 2nd Varsity by 7.2 seconds and the 3rd Varsity four easily. 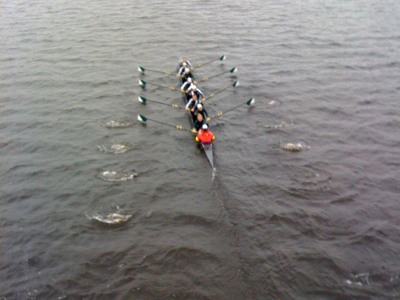 The Big Green's best performance was the first frosh eight. Dartmouth lead Harvard for 1200m then succumbed to a powerful Harvard sprint, finishing 5.3 seconds behind the Crimson and 11.5 seconds ahead of MIT. "It's impossible to ignore the hype about Yale this year. We know they top every coaches' poll. We know they've got monster ergs and they're seeking a third national title. And we know that none of that matters when the starting flag drops. The 1V set out to prove they could hang with the big dogs. We planned to "front load" the race and fight to hold contact with Yale as long as possible. BU fell back by the 500m mark, and we managed to hold onto Yale until 1300m down. We scrambled as the course got rougher but managed to make up a few seats before the finish. No one has been this close to Yale yet, and it wasn't even a clean race for us. This was a huge confidence boost for the 1V; they realize they have legitimate speed and room to get faster. "I'm amazed at how far we've come in less than a month. We really see the weekly stadium runs, intense lifting, and winter erg work paying off. I'm getting more and more confident that this team will make a mark on the league this season! "We're on the right track, and we know what we need to work on. Saturday's racing at #12 Yale proved that much, at least. In calm but rainy conditions, a new varsity lineup looked to bring the Olympic Axe to Hanover for the first time. After the first 40 strokes, our chances looked slim, as Yale took more than a length. But as the crews headed into the turn (we had the outside) down by open water, we noticed that Yale wasn't moving, and they really hadn't moved much since the first 40 strokes. As the guys made the turn, they started moving on the Yale crew from the outside. Yale responded when the course straightened, but so did the guys, putting their bowball level with Yale's stern and then slowly but surely moving on the Yale shell. Yale countered with a lot of shouting and fanfare over the next 500, but they couldn't shake our guys. With 500 left, the guys had pushed their bowball to Yale's 5 seat. With 400 to go it may have been on Yale's 3 seat. In the last 350 or 400, Yale was finally able to push back, eventually winning by 2.5 seconds. The freshman had a similar race that produced an identical 2.5-second margin, while the second and third varsity were 10 and 20 seconds back, respectively. It's dangerous to be anything but disappointed with any loss, and the guys were crushed after the races. But we'll take confidence from the fact that we matched or exceeded Yale's base speed all the way down the course in the varsity race, were right on their frosh the entire time, and were much closer in the lower boats than past years. It's a sign of how far the program has come in just a few years and a testament to the juniors and seniors.